Franklin Delano Roosevelt (January 30, 1882 - April 12, 1945) was the 32nd President of the United States from 1933 until his death in 1945. He served 12 years as President, dying shortly after beginning his 4th term, the longest ever spent in office. After his death, the twenty-second amendment came into effect. It limited how long a person could be President. Before becoming President, he was Governor of New York from 1929 to 1932, Assistant United States Secretary of the Navy from 1913 to 1920 and a state senator from the state of New York. His father, James Roosevelt, and his mother, Sara Delano, were each from rich old New York families, of Dutch and French ancestory respectively. Franklin was their only child. His paternal grandmother, Mary Rebecca Aspinwall, was a first cousin of Elizabeth Monroe, wife of the fifth U.S. President, James Monroe. One of his ancestors was John Lothropp, also an ancestor of Benedict Arnold and Joseph Smith, Jr. One of his distant relatives from his mother's side is the author Laura Ingalls Wilder. His maternal grandfather Warren Delano II, a descendant of Mayflower passengers Richard Warren, Isaac Allerton, Degory Priest, and Francis Cooke, during a period of twelve years in China made more than a million dollars in the tea trade in Macau, Canton, and Hong Kong, but upon coming back to the United States, he lost it all in the Panic of 1857. In 1860, he came back to China and made a fortune in the notorious but highly profitable opium trade supplying opium-based medication to the U. S. War Department during the American Civil War. He is a 5th cousin and a nephew-in-law of another United States President Theodore Roosevelt. His 5th cousin, once removed was Eleanor Roosevelt, who was also his widow. Roosevelt once had an affair with his wife's secretary and later avoided seeing her to protect his political career. Franklin Delano Roosevelt was born on January 30, 1882 in the Hudson Valley town of Hyde Park, New York. When Roosevelt was five years old his father took him to visit President Grover Cleveland. The president said to him: "My little man, I am making a strange wish for you. It is that you may never be President of the United States." Roosevelt became the longest-serving president in American history. Roosevelt was the Assistant of the United States Secretary of the Navy under Woodrow Wilson. He was nominated the vice presidential candidate under James M. Cox in 1920. Cox and Roosevelt lost to Warren Harding and Calvin Coolidge. In 1921, Roosevelt got sick with poliomyelitis, a disease that paralyzes people. He never walked again, but Roosevelt remained physically fit, becoming an avid swimmer. Roosevelt became a champion of medical research and treatment for crippling illnesses, but kept his illness as hidden as much as possible from the public, fearing discrimination. His disability did not limit his political career; Roosevelt was elected the Governor of New York in 1928. His wife, Eleanor Roosevelt helped his career by traveling and meeting people when Roosevelt could not. She became famous as his eyes and ears, meeting thousands of ordinary people and bringing their concerns to Roosevelt. Roosevelt won the election against the unpopular incumbent (president at the time) Herbert Hoover and became president in early 1933. He started a series of popular programs known as the New Deal to fight against the Great Depression. The New Deal gave people jobs building roads, bridges, dams, parks, schools, and other public services. Also, it created Social Security, made banks insure their customers, gave direct aid to the needy, and made many regulations to the economy. Because of this, he was re-elected in a large victory in 1936 and continued the New Deal. The United States did not fully recover from the Great Depression until it entered World War II. In 1939, Roosevelt became the first President of the United States to appear on television. Roosevelt was elected a third term in 1940. He gave weapons and money to the Allies fighting in World War II as a part of the Lend-Lease program at this time, but the United States was still technically neutral in the war. On December 7, 1941, Japan launched its attack on the Pearl Harbor military base in Hawaii. On December 8, the United States Congress declared war on the Empire of Japan. It was formulated an hour after the famous Infamy Speech by Roosevelt. After the declaration, Japan's allies, Germany and Italy, declared war on the United States. This brought the United States fully into World War II. Roosevelt also signed an order allowing Japanese Americans to be sent to internment camps against their will. While still president, he died on April 12, 1945. Vice President Harry Truman became president. World War II continued for almost four more months, but Allied victory was already assured. For overcoming the difficult challenges of a depression and a world war, historians generally consider him to be one of the best U.S. presidents. Section of speech with famous phrase. (168 KB, ogg/Vorbis format). ↑ "Lucy Mercer - Top 10 Mistresses". Time.com. Retrieved 22 August 2013. ↑ "Franklin D. Roosevelt becomes First President to Appear on TV". World History Project.org. Retrieved 22 August 2013. 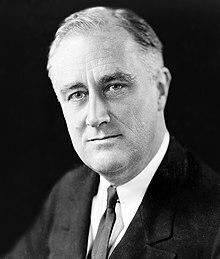 Wikimedia Commons has media related to Franklin Delano Roosevelt. This page was last changed on 1 February 2019, at 15:27.